There's no need to fear, UNDERDOG is here! American Mythology is proud to bring back another nostalgic kids classic to a brand new audience. Underdog is an incredible animated series that chronicled the adventures of Shoeshine, who when danger was afoot would turn into a powerful superhero! 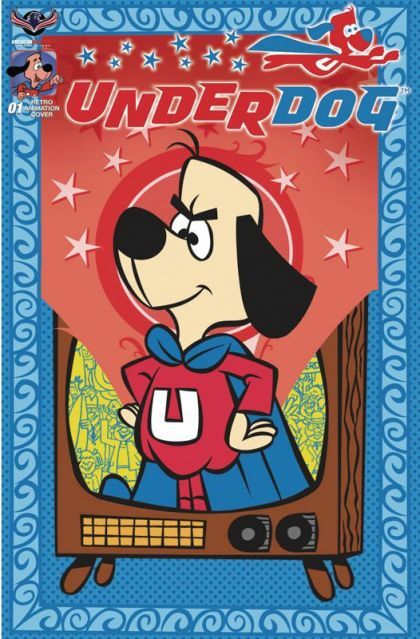 With an incredible rogues' gallery of villains like Simon Bar Sinister, Cad Lackey, Riff Raff, Battyman, and Overcat on the loose, the world needs Underdog more than ever! Get in on the all-original first issue of Underdog by Batton Lash (Supernatural Law) and Bill Galvan (Pink Panther), in stores before Free Comic Book Day! Covers by interior artist Bill Galvan, Adrian Ropp, S.L. Gallant, and Retro Animation Incentive cover by vintage animation artist Patrick Owsley. And be sure to pick up the Underdog Free Comic Book Day edition with even more new stories and fun!